One of the best brands carried by Racing Planet is Polini. It means high-performance and quality in the world of scooters! 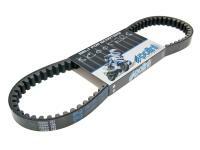 Racing Speed Belt by Polini. This v-belt features an aramid weave that makes it elastic and highly durable. Please measure your belt and compare with original prior to order. Click on the applications tab to see if your scooter is listed on the applications page. Will work on select Genuine Scooters USA models. Please see PGO list. Genuine's Roughhouse R50 scooter (2008 - present) is made by PGO Taiwan match to model PMX 50. Polini S.p.A. is an Italian manufacturer of tuning parts for motorcycles, mopeds and scooters. Among other products, they produce high-quality racing belts, cylinders, pistons, clutches, and variators for both racing and road use. 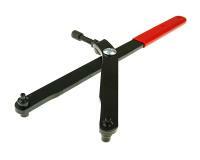 Racing Planet is proud to carry the scooter racing range of Polini scooter parts. On our site you can find the greatest selection of the Italian brand in the USA. If you need Polini Scooter Parts you came to the right scooter parts shop.